CHARLOTTE AMALIE, St Thomas, USVI — Two linemen of the Virgin Islands Water and Power Authority (WAPA) were transported to the Schneider Regional Medical Center for observation and treatment of injuries Tuesday evening, January 5, 2016 after the bucket truck they were driving in crashed into a utility pole on Solberg road, St Thomas, US Virgin Islands, a press release WAPA issued late Tuesday has revealed. The truck experienced an apparent malfunction before striking a pole, flipping and coming to rest on its side just after 6 p.m. The accident and impact with the utility pole sent a surge through the electrical distribution system tripping up to five feeders. According to the release, while emergency personnel tended to the injured workers, WAPA staff quickly restored power to all affected feeders and within an hour, isolated the accident area and restored service to the remainder of Feeder 7A. The accident also caused a problem on a small area near the Contant Carwash and in Estate Altona. About 400 customers on Feeder 7A remained without service while crews from WAPA and Public Works worked to upright the bucket truck. US Virgin Islands Police and Virgin Islands Fire Services also assisted with crowd control, the traffic investigation and the clean-up of spilled fluids from the overturned utility truck. “I am first of all grateful that the two line department employees were not seriously injured. We took the precaution of having them undergo an evaluation at the hospital,” said WAPA Executive Director Hugo V. Hodge, Jr. He applauded the actions of the truck crew who upon realising that the vehicle was malfunctioning made a quick decision to turn it into the bushes off the side of the road and away from a steep turn that was just a few hundred feet away. “Had they ended up in that turn, there was a good chance that the accident would have been catastrophic,” Mr Hodge said. 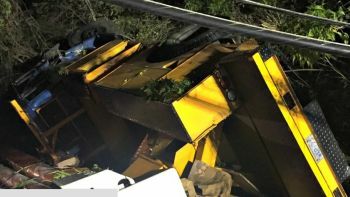 He apologised to the public for the service interruption caused by the accident but assured the customers that remained without electrical service through the 11 p.m. hour that full service would be restored before the night was out. “We will remove the damaged vehicle and then work to secure the snapped utility pole and restore power to the immediate area. Innovative Telephone was also notified of the accident and its crews were dispatched to determine whether any telecommunications infrastructure was impacted by the accident,” Mr Hodge said. An internal investigation led by WAPA’s Safety Division has commenced into the cause of the accident. How much bad behavior by VIWPA is too much?